Get ready to improve your Norwegian vocabulary with the 500 most common verbs in Norwegian! 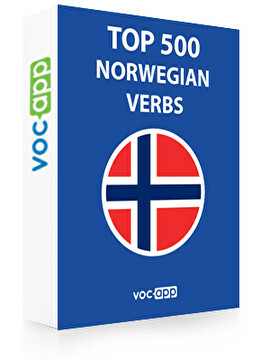 With VocApp’s "500 most important Norwegian verbs" -course, you will support your Norwegian language studies, and learn and memorize more and more useful Norwegian words. Each verb will have an example sentence for it, which helps you to understand the meaning of it better. Want to say you’re doing something, or you like something, or maybe that you love something in Norwegian? VocApp will teach you these and a great variety of other verbs that will boost your Norwegian language skills significantly. With this verbs list, you will be able to communicate with Norwegian people in their native language much more effortlessly. You will not only improve your vocabulary but also gain more confidence the more you learn. With this list of verbs, you will not be at a loss for words again! Fed up with language learning apps that are tiring or do not give you the results you hoped for? Haven’t found a Norwegian language lesson that would have felt right for you? Don’t worry - VocApp offers you with the best way to learn Norwegian. VocApp’s learning methods are proved to be effective and to provide excellent results. The studying methods are based on multi-sensory learning – for example, pictures for visual learning, and recordings of the word for learning by listening – which works better than most of the traditional language courses. Learn the Norwegian language regularly to get the best possible results – with VocApp, you can set notifications at your chosen time to remind you about studying. Only 5 minutes per day will help you learn a language! Study wherever you are on your mobile device or computer – at home, while commuting to work or school, while on a holiday… Learning Norwegian vocabulary has never been so easy and entertaining. Improve your vocabulary with our courses: Norwegian Words: Top 300 Adjectives and Norwegian Words: Top 1000 Nouns .